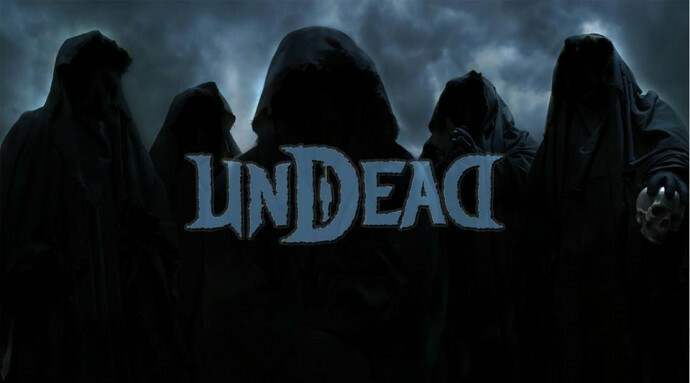 My introduction to Undead came by way of their first single, “Voices Within”. The blog entry that accompanied the track only had a brief excerpt from Undead’s press release. It revealed some of the legendary metal acts that have influenced the band but not much else. In a time when we’ve become so accustomed to being given lengthy band bios, Undead has chosen to share very little about the band’s creation. The faces of the band members are hidden under ominous hoods, their identities a mystery. Their country of origin was omitted. The video for “Voices Within” even broke with tradition by not including the lyrics for the song. And so it fell upon the music to do the talking, and it most definitely delivered. “Voices Within” is a sinister dose of old school death metal, rising up from the darkest depths to claw its way out your speakers with vicious riffs and demonic growls. For me it was love at first sight. I had to interview this band. My prayer to the dark lords of the underworld did not go unanswered. I was granted an interview with Necros and King Oscuros, shortly before the release of their debut album, False Prophecies. Derek: Hello! Thank you very much for granting me an interview! 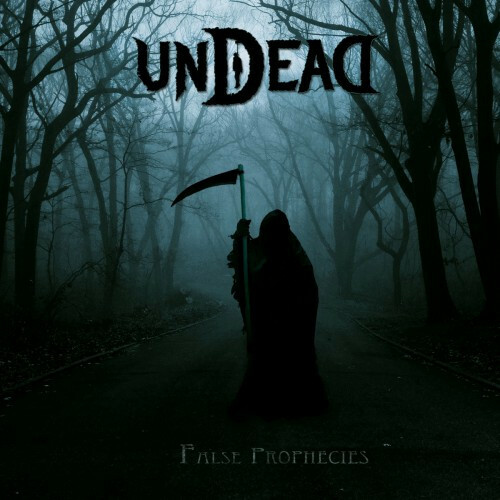 Undead was introduced to the world a few weeks ago with the release of the excellent track, “Voices Within”, from your upcoming album, False Prophecies. Aside from that, very little is known about Undead. What can you tell me about the formation of the band? Will you be revealing the identities of the members at some point? Necros: We came back from hell to revive the original flames of Death Metal. It’s what you have to know about UNDEAD. We’ve no reason to show our faces, we want to show our souls. And why would we do that? It’s only about music here! We want our listeners to dive in our universe, without any musical bias. If I told you that one of our musicians plays in Fear Factory, your vision of UNDEAD would be filtered by the origins of the musician, even if the music is very different. It’s just an example. We don’t have a member of Fear Factory in UNDEAD. We want the public to focus on UNDEAD’s music, not on UNDEAD’s members. Derek: From the very first moments of “Voices Within” I could tell that I was going to love Undead. How you would you describe your sound to somebody who’s never heard it? Necros: Dynamic, acoustic, powerful, melodic, and terrifying are the right words to define the music of UNDEAD. We play Death Metal inspired by the origins of Death. The time when the frontier between death metal and grind core was distinguished, when the melody had an important place in the structure of the title, when quickness was not essential. False Prophecies” is close to first DEATH and contributes to its evolution. Some people say that False Prophecies could be somewhere between Leprosy and Spiritual Healing. It’s true we find similarities with the sound of this period in the album. Derek: What is the inspiration behind the lyrics on “False Prophecies”? Does the album have a central theme? King Oscuro: Human kind is turning on itself day after day with no goals and rejects any spiritual progress, it’s actually the very picture of mankind’s evolution down this planet, locked down through a constant chaos, the one who cannot overcome his fears, the one who is seeking the truth into the sacred texts, the one who understand that the secret of life is somewhere else… the cynicism of our entire civilization, and at least the one who’s seeking for the light of redemption across this flood of vanished souls … this is what our inspiration is all about. Derek: False Prophecies will be released on April 27th. Will Undead be touring to support the album? Is there any chance you’ll be visiting North America? Necros: We are thinking about it. I can’t tell you more about it right away. I’ll just add that UNDEAD on stage will be the funeral march that will bring the end of the world. Our paths will mark each one of our kingdoms for life. Derek: Will you be doing live performances with your faces concealed, in the same fashion as Portal or Ghost? Will there be any kind of theatrical aspect to your shows? 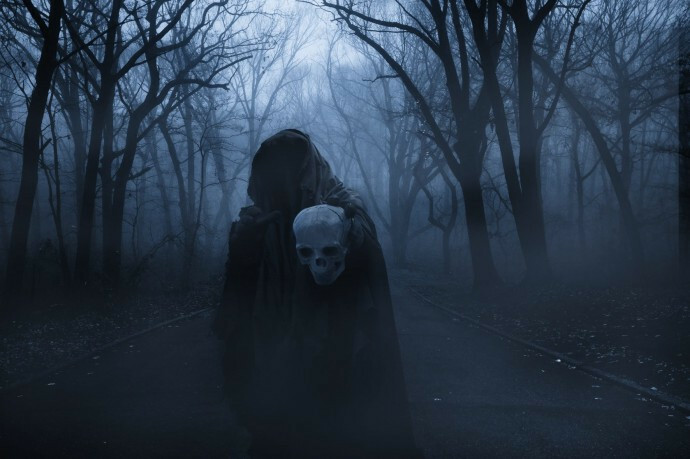 Necros: We are getting ready for the funeral march…Even if our faces will not be shown, It will not be the same atmosphere as Ghost, you can be sure of that. Derek: I can’t wait to get my copy of False Prophecies, but like a typical metal junkie I can never get enough! Are there going to be more albums by Undead or is this just a single-album project? Necros: Thanks a lot. It’s a bit premature to talk about a follow-up album as our album just came out. With False Prophecies, we’re far from being done. Derek: Now it’s time for my “Firsts” Round of Questions! What was the first guitar/bass you ever owned? What was the first metal album you ever owned? And what was the first metal concert you ever went to? Derek: Thank you for taking the time to answer my questions, I really appreciate it! I can’t wait to hear the entire album! Is there anything else you would like to say to all the old school death metalheads around the world? Necros: Chuck passed on something huge and we’re here to revive this: The origins of Death Metal! You’ll take pleasure in listening to False Prophecies, that is for sure! Listen to “Voices Within” from False Prophecies and then stream the rest of the album via Bandcamp! Hey, this seems to be good! The answers were not that gimmick than I thought. Thanks for this Godless Angel!